Killer Characters: The Name Game + Giveaway! The Name Game + Giveaway! Hi! Madison Night here. In addition to being a mid-century modern interior decorator and a sometimes amateur sleuth, I'm an unofficial expert on all things Doris Day. I was born on her birthday (April 3), and have made a careful study of her movies to refine my decorating eye. In addition to that, I've taken an interest in her whole life and she's become something of a role model for me. And I find it very comforting that so many of the people I encounter in my life remind me of people connected to hers. Captain Tex Allen of the Lakewood Police Department: His last name is "Allen," just like Rock Hudson's character in Pillow Talk! And "Tex" reminds me of "Rex Stetson," the alter-ego of Rock's character in the same movie. If Captain Allen has an alter ego, I'm not sure I'd want to know! Hudson James: Here's a secret I've never told anybody. When I first had to hire a handyman to help me out with Mad for Mod, my decorating company, I placed an ad and a lot of people answered. I chose Hudson because I thought his name was a sign. And I guess, in a way, it was! It's no secret that I named my puppy after Rock Hudson. But he's so cute I can't help but call him Rocky. I think it's funny that both Tex and Hudson call him Rock, as if adding the "-y" on the end of his name is somehow less manly. Connie Duncan is a client turned employee turned friend. And isn’t it coincidental that Doris Day’s costumer turned assistant was named Connie? Brad Turlington: the man I once thought of as the love of my life. Did you know that the author who writes about my adventures, Diane Vallere, used to work in fashion and once worked with a personal stylist named Brad who owned Doris Day’s former house? It’s true! Delbert Manning: the security officer in LOVER COME HACK’s name bears a very close similarity to “Delbert Mann,” the director of Lover Come Back. Delightful! Thelma Johnson: the owner of the house that I inherited through some unusual channels reminds me of Thelma Ritter, the maid in both Pillow Talk and Move Over Darling. Detective Henning: One of the writers of Lover Come Back was named Paul Henning! You know, sometimes when I sit back and relax and think of all of these wonderful (and sometimes not so wonderful) people who enter my life, with names that remind me of Doris Day and the movies she made, I can’t help think my life is close to perfect—except for the murder investigations. I could probably do without them! 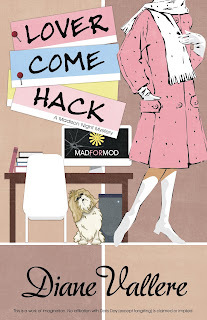 LOVER COME HACK: new Madison Night Mystery! Thank you for the giveaway! I love Doris Day! Thanks so much. I enjoyed your post. Love your series Diane. I already won a cop of Pillow Stalk from you so I'm not entering. Thanks for sharing about your new book.